The job of Nullsec sovereignty powers is to be the easily-found game content for each other and, even more often, for NPC dwellers. CCP risks making that job so unprofitable that the supply of content dries up. Eve PvE gameplay is notoriously horrible. This is not a unique problem: MMO PvE in general barely rose above the level of “kill ten rats” for many years. But, lead by World of Warcraft, the genre has gradually dragged itself up to a level where entertaining and varied scripted content is available, whether for solo or group play. We in Goonswarm have always prided ourselves on the transparency of our democratic process. Nothing is hidden from the line member or the outsider about the subtle checks and balances that make sure that too much power is never concentrated in the hands of anyone who is not called The Mittani. I was therefore the proudest Goon in my whole house when I was awoken by a call I received around 0430 on Sunday morning. A voice suspiciously like that of Dear Leader in falsetto said “I have The President of the CFC on the line for you with an important message.” Naturally I got out of bed and stood to attention before responding. I could not have been more delighted nor amazed. “My application was successful? And to think I didn’t even know that I had applied!” I’m not going to lie to you, it came as the biggest surprise to me since the time Mittens informed me that my application to manually fit one thousand seven hundred frigates ahead of the 2011 newbie drive had been successful. Anyway, Mynnna has decided, after a year successfully representing not just Goonswarm but also many other areas of the Eve community, that he has had enough of rude and abrupt proto-Scandinavians and has elected to step down. I will endeavour to persuade you that you should vote for me for this year’s election, initially through reasoned argument and easy accessibility, but later, and in desperation, through the Avalloc method of promising to personally demand of CCP that every request made of me be enforced, no matter how borderline lunatic or even downright treasonous it may be. Note: This will not interfere with my ongoing role as CSM Election Campaign Organiser for Pandemic Legion’s top poster Walter “Doink” Stine. A man needs to stick to his priorities or what else is left to him in this life? Here’s a fundamental law about Eve: any penalty imposed on players will tend to hurt the most organised groups least. In other words, if CCP don’t like something, and they try to make it harder to do it, then the people that get hurt will be the younger, smaller or more casual groups. The ones who work around it will be the larger, more established groups who can bring their organisations to bear on the issue. As I said yesterday, I’m pretty positive about the suite of changes announced by Greyscale: I think that they would be better timed if announced in parallel with substantial enhancements to nullsec to allow greater density of living, but I am sure that that must be coming very soon. From the point of view of the established blocs, one reassuring factor in these changes has been the amount of warning and information we have had in advance. Normally, these sort of changes go through the CSM, who sign NDAs and can’t tell nullsec leadership what is in the pipeline. This time, CCP avoided using the CSM in the main and went direct to a nullsec figure who had posted about his ideas: celebrity Fleet Commander Manny of Pandemic Legion. Since Manny isn’t bound by an NDA, much of nullsec has been aware (or at least those whose FCs play DotA together have been!) about what is in the post. As I was on the record as applauding Manny’s changes, I for one was pretty relaxed about what would be announced, which is why I didn’t bother blogging any further once I started to find out what was coming. The political machinations behind the scenes to prepare for these changes have therefore been going on for at least a couple of weeks: at least one very major player in the current balance of power has seen this as a chance to return to their roaming roots/cast off the shackles of sov etc etc, and some very interesting changes may result. Don’t get me wrong: I do think that the CSM should have been more involved, and I understand why they are pretty peeved. But from the point of view of the nullsec bloc, having one of “our own” driving the change is certainly comforting. This should explain why the CFC, N3 and the like are relatively sanguine about the outlook following the changes announced this week. Yes: living in nullsec, outside of a few locations with superb empire proximity, will be made massively harder thanks to the Jump freighter (and, to a lesser extent, Rorqual) changes but we’ll be able to work around that due to the resources our blocs offer. People in the Drone regions, and in the deep south, will be stuffed. There is a disputed quote, often attributed to Bradley, that says “Amateurs study strategy, professionals study logistics”. A great many people on the Eve Online forums – none of whom have ever run a nullsec war – are looking at the announced changes and rubbing their hands over the death of the CFC. I was told, yesterday, that the CFC would “struggle to hold onto ten systems”. Serves me right for commenting on en24. A far smaller group – those who can see the outcomes more clearly – are looking at these changes and thinking “this entrenches the blocs”. I’m torn. I want Eve’s current landscape to burn. Those who read this blog will know how radically I want to shatter everything about the blocs. And I genuinely pity those who depend on Black Frog, for instance, since they themselves have described why that will be driven to the edge of extinction. But until the big changes happen – and I am certain that Greyscale and Seagull will have a plan for the positives that will make these nerfs make sense, then at least these changes will make life easier for us to keep what we have. Let’s be honest, since it’s just you and I: don’t you just love these days? The CSM in an uproar; every forum with the most tangentional relationship to Eve stuffed to overflowing with google-translated petitions and rageposts and quitposts; all the Sturm und Drang that disappeared when CCP got their fingers burned over Walking in Stations and vowed never to change anything about the game ever again. It might all be as tense as a western journalist in rural Syria but at least it is interesting. First, let me say that I don’t think that the changes that CCP have announced in their latest dev blog are bad in themselves. As perhaps the most visible proponent of a more fractured, regional Eve I was enthusiastically in agreement with Manny’s original suggestions to heavily nerf force projection. I certainly applaud the direction in which CCP are moving with this first draft of their changes: you can’t make wars smaller and more disparate if everyone can get to every fight in six minutes of time dilation in the target system. I want the people fighting in Fountain to be different to the ones fighting in Vale. So, unlike some in senior nullsec leadership positions, I am not shrieking about the eldritch horrors and non-euclidean surfaces of this draft version of CCP’s changes. But I do think that, unaltered and implemented in isolation, they will have deeply chilling effects on both nullsec and on CCP’s profitability. In case anyone accuses me of opposing these changes due to self-interest, let me state that we’ve had several Goonswarm groups – Logistics, Corps Diplomatique, FCs – working on modelling the likely impact of these changes. The conclusion we have come to is that the biggest gainers in the game are the CFC. We might choose to seize a couple of additional locations, but we’re pretty confident that we can, if we choose, hold our existing empire. If hostiles haven’t yet spotted the reasons we become essentially unassailable then they may try to make a multi-pronged attack, but this will fail after a handful of easily-retrieved systems are taken. These changes entrench the CFC at the expense of virtually everyone else. I do not view this as a good thing. Wait did you not read the bit about carrots and sticks? I know that both CCP and the CSM read my articles on making a more Balkanised, chaotic Eve. When laying out my vision for an Eve of shattered empires I repeatedly stressed that the stick does not work. I hope that CCP are making these changes because they are implementing the sort of ideas I spoke about: changes to make far denser occupation of nullsec space possible, and which remove the need to travel far for profit or for fights. Indeed, for that sort of Eve to work, the ability to travel across half the galaxy at the drop of a hat must be removed. But leaving Eve in its current form, with fights distant, logistics onerous and space incapable of supporting a dense population and bringing in these punitive measures in an optimistic attempt to force certain blocs to shatter is financial suicide. People will unsubscribe and the flow of new players will (for reasons I detail below) slow to a trickle. I like Eve and I do not want these things to happen. Even if CCP presses ahead with these changes – and with refinement I think that they should push on with almost all of them – then they should do so only when they remove the absolute need for player groups to spread out over large areas. No need for me to go over my suggestions for that, yet again. Why do you Hate New Players and Their Money, CCP? The deathcloning change – making it possible only to set your medical clone to your current location – is the scorpion in the shoe of this change. I can see the reasoning behind this change. Let’s imagine that the scenario which has been attempted so often is repeated once more: Someone attacks the CFC in Fountain, someone else in Delve, someone in Pure Blind and a fourth attacker in Vale. Each of those four attackers is essentially isolated: you could very rarely ask your pilots to gate it from Fountain to Vale, but it would be a pain. 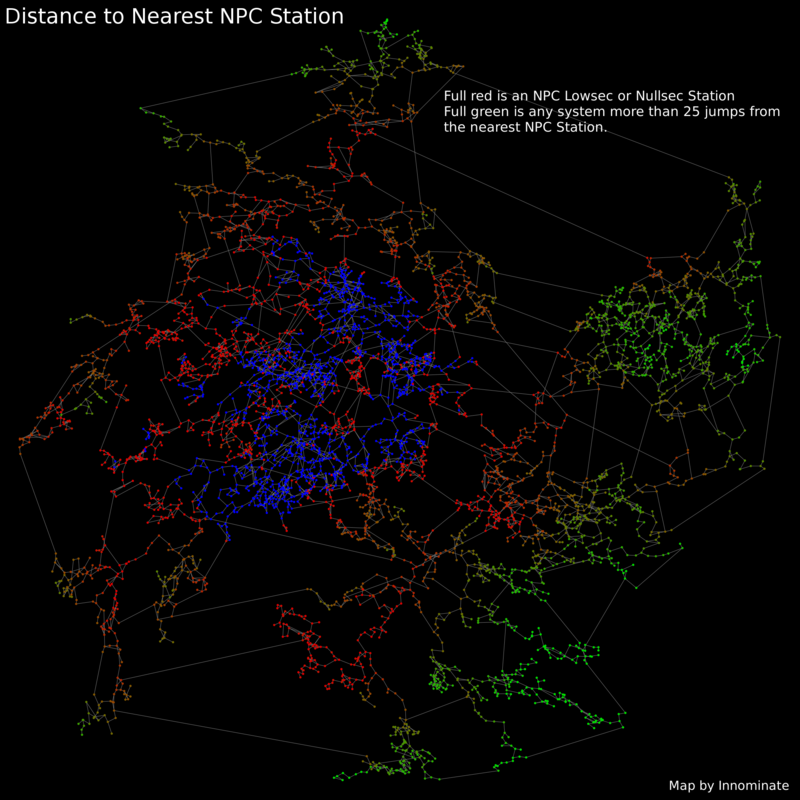 But if people can deathclone around then the defenders in particular can have numerous office stations in each region to which their entire bloc can jump in minutes, while attackers will be scrabbling for enough offices for a dozen corps in NPC null. So yes, the ability to deathclone around every day – or many times every day – should be stamped on. You might say lawl stupid newbies but new players are the health of the game. And this is no theoretical matter: I was preparing to kick off our annual newbie drive this week, but I simply cannot do so when we can see clearly that we will lose most of the new players before the month is out. And if you think that that’s a minor detail then it’s no idle boast to say that between Dreddit, Goonwaffe, BNI and others we bring in many thousands of new players every year, who I strongly suspect have far better retention statistics than random individuals who mission in empire for a few weeks, alone and friendless, and who pass from the game unmourned and unknown. I would strongly advise CCP to make deathcloning possible on a timer of, say, eight days with a skill that reduces this by a day per skill level. But don’t put your thumb in the end of your newbie hose, because you’re not going to survive long on your declining veteran base. The wolf eats the deer. The wolf is sated and, for a while, suffers no sensation of hunger. The deer is destroyed utterly, and suffers pain and terror in the process. This is not a zero-sum game. The pleasure in the moment is vastly outweighed by the pain. Last week, I posted about the need for Eve’s nullsec Sovereignty system to be redesigned in order to break up blocs, shrink alliances and give a chance to younger players to strike out into nullsec without the risk of being stamped upon. The key post with the vision and reasoning behind this is found here. Will nobody think of the newbies? A very quick post just to address a concern that a few people raised abour yesterday’s rather controversial example of an sov system that would promote smaller groups in Eve. I just sent this broadcast out on Goonswarm jabber. Warning: Marivauder, who joined Bat Country after stealing the contents of his previous wormhole corp’s POS, is a dirty thief. He put an alt in droneland pets BCA*, who welcomed him with open arms, and how does he repay them? He warps to a POS, finds the pos shields set to alliance access, finds their XLSMA set to alliance access, peers inside and finds an Aeon. You or I would have discreetly informed a senior member of BCA of this ghastly oversight. But not this untrustworthy ingrate. So he popped it out, jumped it to a cyno lit by his alt, jumped that into the Aeon and made his way back to BCA to await further gifts. Plus one GSF aeon and the GIA sends its regards. Be sure to shun this wicked malfeasant. *We kicked BCA out of Deklein for being useless, almost four years ago. Nothing much has changed, obviously. This theft took place in the last few days. I can’t tell you the exact day because we don’t want to risk burning the spy. But it is very recent. To clarify, Marivauder is a member of Bat Country, and one I’ve met and drunk with. I am not actually angry with him. Not today, anyway. You should totally let his alts into your alliance. He has an agent in BCA. That’s not unusual: Bat Country run the GIA (the Goonfleet Intelligence Agency), and have done for years, and a lot of its members have agents in hostile alliances. That has its downsides, too: with so many senior members playing Eve Online on two sets of accounts, burnout is a bit more common than in most corps, and at any given time we have a few people who just play DotA or other bad-but-not-as-bad-as-Eve Online games on Teamspeak, but we do try to get together for roams and corp ops to keep people from missing the company of their own corp too much. We also host spies from other alliances, such as Vince Draken, whose time as a spy here ended in jollity and with whom we like to think we’re still on good terms. There is certainly a home for him here when this whole NCdot nonsense blows over. Last night, in the hour or so before I ran a fleet through Syndicate, I got dragged into the first episode of largely-Eve Online-related podcast ShitonZulu, hereafter known as SoZ for workplace firewall reasons. You can listen to it here http://shitonzulu.com/ although for some esoteric reason Doink has made it so you have to unlock the occult secret podcast by clicking on the word “Episodes” first. The site itself is pretty work safe, containing only the title and a picture of Peter O’Toole in his role in Zulu Dawn. That, as an aside, is rather ominous as Zulu Dawn was the vastly unsuccessful sequel/prequel/follow-up to the superb Zulu, which is a film every man should see at least once in their life, and preferably once every Christmas. The second half is basically one extended battle scene full of stiff upper lips and a young Michael Caine at his best. If you stick Jeffraider, especially sober Jeffraider, into any discussion it tends to make the mood happier while simultaneously preventing anyone taking themselves too seriously, which might otherwise have been a real problem for me given how passionate I risk getting about the need for reform in Eve. I did get to bang on about my ideas a bit, though, and people were very tolerant.